Organizations seeking to develop a virtual business model must also be in a position to effectively implement it on a business level and on a technological level. (Venkatraman, 1994; Venkatraman & Henderson, 1993,1998). Since technology is a critical success factor to any virtual organizing strategy, the analysis of e-business is interesting due to its business focus and its ability to flexibly and rapidly support changing business needs and requirements. In essence, e-business is a composite of the above-mentioned perspectives and whose definition can be used inter-changeably with virtual organizing because of its open technologies and collaborative strategies. Is there a winner in this battle between Crystal Ball and ModelRisk? To quote that way-too-often-quoted reply: It depends. Some users will value certain technical capabilities over others. Some users will value user-friendliness over accuracy. If there is to be a group deployment of a MCA spreadsheet package, usability may trump technical capabilities overall. Does it matter if one package has more distributions to choose from if there are only three that are of interest for your particular class of stochastic problems? Would it matter what kind of correlation enforcement method is used if, as in many manufactured assemblies, there is practically no correlation between separate components? Probably not. But if they do (as in financial and insurance applications), there will be a clear winner. Correlation behavior in ModelRisk is enforced with the use of copulas. Copulas offer more flexibility in accurately simulating real data scatter-plot patterns than do single-value correlation coefficients. While this advantage is clear for financial and insurance applications, its implementation in an MCA spreadsheet simulator can make the difference between universal adoption and rejection by a majority of the intended user group. 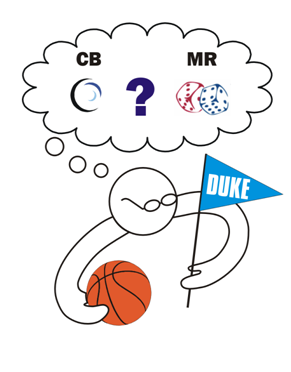 Let us now use ModelRisk (MR) to enforce the correlation behavior between Duke Basketball offense scores and their opponents' scores, based on the '09/'10 historical data. 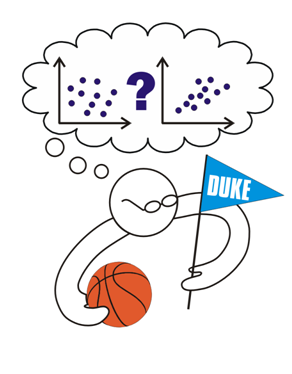 In our quest to simulate future Duke Basketball scores, we have taken past historical data of individual games during the '09/'10 season and fitted probability distributions to that data. Two PDFs are generated; one for Duke's scores (offense) and one for their opponents' scores (defense). We have used both Crystal Ball and ModelRisk to perform this task. Is there something missing in our PDF formulations?